It’s football season, so let’s talk game hair! You can show your school pride with quick braided hairstyles that showcase your football team colors. This style is awesome to add to your school spirit day ideas, too! Friday night should have been the second football game of the season for us, and you know my family doesn’t miss a game. Ok, so maybe I just go for the half-time show (Pooh’s in marching band! ), but Coach and Tigger actually enjoy football, too. My brain just doesn’t do football, y’all. Please don’t hold it against me! What my brain does comprehend is game hair! With two young daughters, I’m always thinking about hair for girls, cute school hairstyles, and quick braided hairstyles. One braid hairstyles are the best, because we always seem to be in a hurry to get to school, or the football game, on time. This past weekend was a little different, since the game got rained out (ok, lightening-ed out) on Friday and rescheduled to Saturday night. We actually had a little extra time to get ready, and the weather was much more agreeable on Saturday for some cute game hair! I decided to play around on Tigger’s hair and give her a cute one braid hairstyle that showed off her school pride. With all that extra time, I even broke out the curling iron! I started by curling her hair with my favorite 1-inch curling iron from Hot Tools. This step is certainly not necessary, but it definitely made Tiggs happy. I used my favorite setting spray, Redken Hot Sets, on each section before curling. to make sure the curls would hold. Tigger’s hair doesn’t hold curl for too long, but even in this lovely Deep South humidity, Hot Sets helps hold them a little longer. Ok, maybe not that long…. To make sure her school pride was evident, I worked in a ribbon with our football team colors…we’re the black and gold Bobcats! This cute gold metallic ribbon was perfect for braiding in, since it’s small and lightweight. You can find perfect ribbon for this look in all kinds of football colors on Amazon, like this one and this one. Those links are to my favorites; I have tons of American Crafts ribbon variety packs like that and it’s the exact size you’ll need for small braids. I’m going to show you how to do this adorable game hair, so your kiddos can display their team colors in their quick braided hairstyles, too! Drop out a section of hair from the top of her head down to the ear, maybe 3 inches deep, and then grab a hunk (about a 3-inch wide hunk to be precise) of hair behind that to braid. I started by securing the section I planned to braid in a small elastic with the gold ribbon, just to make sure it wouldn’t slide out. Braid that piece with the ribbon included on one of your sections, but don’t worry too much about the ribbon just yet. Once your braid is complete, go ahead and secure the tail with another little elastic, but not too tight. Start at the bottom and gently fluff up the braid sections with your fingertips, working your way to the top, but stop fluffing about 3/4 of the way up. This is when you can pull your ribbon to the top and make sure it shows! This method makes the braid appear fuller and gives it a softer look. Drop the braid now, and starting from the opposite side, smooth the top half of hair back and pin in place (this is when you’ll want one of my super-awesome magnetic bobby pin bracelets…it’s so handy to have those pins right at your fingertips). Use a criss-cross method to pin that section securely. Now take that section of hair from the other side that you left out in the beginning, and smooth it back, as well, making sure to cover up the top of the braid where the elastic is, and pin that over the first section. Yes, your pins are showing, but the braid will fix that! Watch with dismay as teen child hands phone to pre-teen child to hold while teen child does something else. Wait while pre-teen child takes selfie. Resume. Pick up the end of the braid and use the whole braid to cover those pins, tucking in the tail and pinning it underneath. Pin it all securely, making sure to hide all the bobby pins underneath the braid. You’re done with your cute game hair, and your football team colors are on display! Isn’t that adorable? What’s funny is Tigger had no idea she had a gold ribbon in her hair until one of her friends spotted it at the game and pointed it out. Ha! I’m sneaky like that. 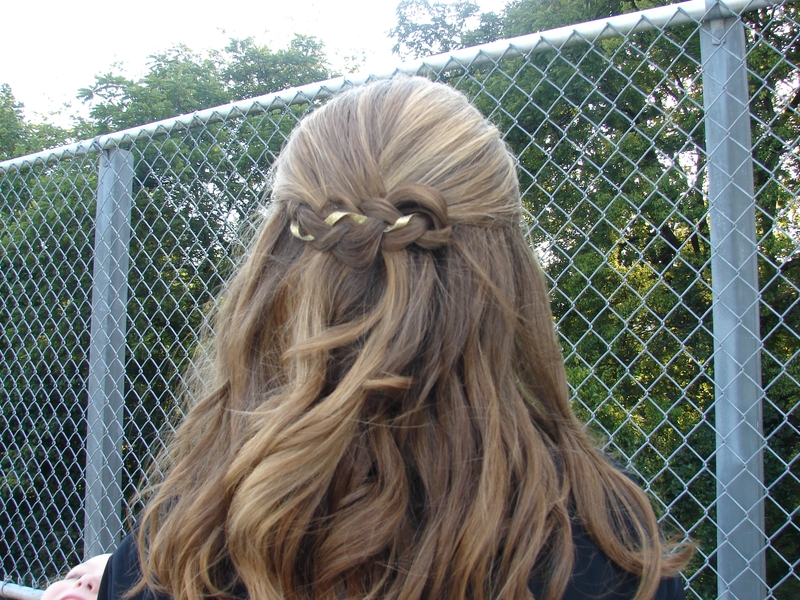 I hope you’ll try this out, and add it to your game hair repertoire, or your school spirit day ideas! Quick braided hairstyles are so on trend, and one braid hairstyles are a super-fast way to get the looks you and your girls love! What did I do to Pooh’s hair, you ask? Well, a few things…each of which she destroyed before wearing her hair down and wavy to the game. She’s 14, y’all, so I am a complete hair idiot! And I thought all that expensive training and behind-the-chair experience meant something! Ha! She looked gorgeous, as usual, and did a fantastic job on the half-time show and in the stands. Thanks, Kim of “Kimages” for the awesome shirt design!! Jimmie Threw ME Under the Bus! New Makeup Trends 2016 | With Avon! That’s great hair (and a great selfie)!